Bruins versus Canadiens. The greatest rivalry in all of hockey. I say it’s the greatest in all sports. Some will argue that the rivalry between the Red Sox and Yankees holds the title, but I disagree. It all began December 8 1924. A 4-3 come-from-behind win for the Canadiens. Pffft. Now you might ask: what makes a rivalry? Well let me tell ya! These two teams have met a total of 915 times. The all time record is 466–338–103–8 (MTL). Yuck. They have met in the playoffs 34 times. They have faced each other nine times in Game 7 of the playoffs. That’s more than any other two NHL teams. I’d say that’s enough for a rivalry! 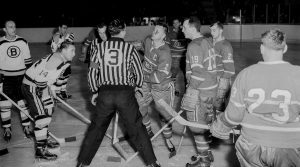 On the night of March 13 1955 in Boston, Maurice Richard got into a stick swing altercation with Bruins’ defenseman Hal Laycoe. Both ended up bloody. Boston Police tried to go to the Canadiens dressing room and arrest Richard. After all said and done Richard got a match penalty and an automatic $100 fine. Laycoe got a 5 min major and a 10 min misconduct, which came with a $25 fine for the high stick. This is what started the Richard Riot. Clarence Campbell called a meeting on March 16 and suspended Richard for the remainder of the regular season and playoffs. The longest ever in Campbell’s 31 years as President! Habs fans were calling for his head issuing death threats to Campbell. The suspension cost ‘Rocket’ the scoring title that year. Yup, there were some unhappy people in Montreal! Between 1965 and 1979 the Bruins and Canadiens made up 16 of a possible 30 Stanley Cup finals. They went head-to-head in 1977 and 1978 Stanley Cup finals. Montreal won 4-0 (1977) and 4-2 (1978). In 1979 they met in the semi finals. I really hate reliving this next part. In Game 7 the Bruins were winning with 4 mins left when they got the infamous penalty for too many men on the ice. Then came the non-call for offside. 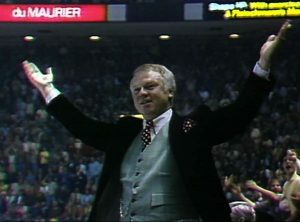 In the end that marked the last game with Mr. Don Cherry behind the bench. Let’s jump ahead to the 90’s. The Bruins knocked out the Canadiens in the first round of the playoffs in 1994 in seven games. You might remember this series. Patrick Roy was diagnosed with appendicitis and missed Game 3. He convinced doctors to let him play in Game 4. Canadiens fans will argue that made the difference in the series. Any excuse will do I guess! In 2000 and 2001 both teams missed the playoffs. Then in 2002 and 2004 the Canadiens defeated the Bruins in the first round both times. In the 2004 playoffs the Bruins held a 3-1 series lead with the Canadiens coming from behind to win. That was the first time the Canadiens had won a series when trailing 3-1! During the summer of 2007 the Bruins hired former Habs coach Claude Julien. That year the Canadiens won every meeting between the two teams. During that regular season Steve Begin crosschecked Marc Savard from behind resulting in a broken bone in the back. Now you all should remember the 2010-2011 season. Montreal won four of six meetings that year. Feb 9 had a brawl with two all-star goalies squaring off at center ice. The bigger Carey Price manhandled the hot-headed Tim Thomas. Now this next one is a real sore spot for Canadiens fans. March 8 of the same season the Canadiens won the game 4-1 but this is the game where the mighty Chara rode Pacioretty into the turnbuckle. His head hit one of the metal uprights and he was knocked unconscious. Chara wasn’t fined or suspended for the hit but received an interference major and a game misconduct. 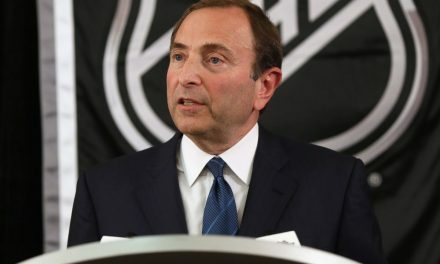 Habs players and fans wanted a suspension and the Montreal police even conducted a criminal investigation into the hit. Again they met in the first round of the playoffs that season. 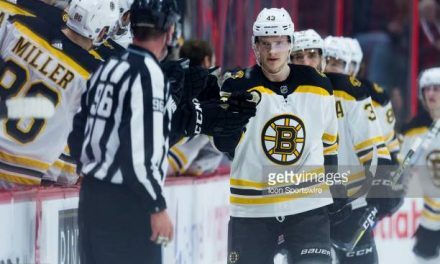 The Bruins lost the first two games at home after finally winning the series in 7 games on a 2nd OT goal by Nathon Horton. The Bruins became the first team to win a 7 game series without scoring a power-play goal. During Game 4 of the series the rivalry got heated up just a bit more if that’s even possible. Hometown favorite Andrew Ferrence made the famous obscene gesture to the Canadiens fans and was fined $2500 by the league. No suspension. And in Game 6 Milan Lucic got a 5 min major and a game misconduct for boarding hit on Jaroslav Spacek. This was season was my absolute favorite! 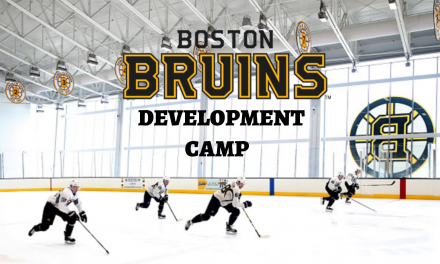 The Bruins made it to Stanley Cup finals defeating the Canucks in 7 games! First time I got to see them hoist the cup. They won it all in 1972. I was born in 1973. 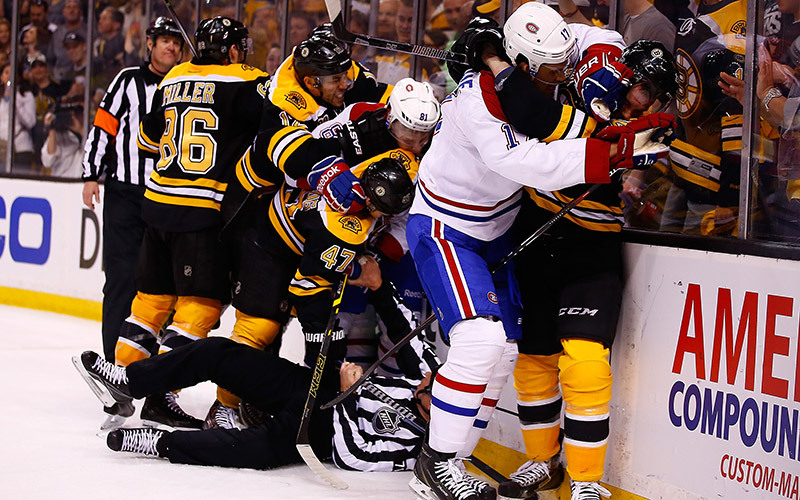 It was the first time the Bruins beat the Habs on route to a cup win since 1929. The Bruins fired Julien. The Habs rehired Julien. Bruins have a rookie coach. Habs are having trouble getting above .500 hockey. Bruins are having injury troubles. And they will meet for the first time this season on Jan 13 2018. Me and a friend have some wobbly pops on the line for this meeting. This is a much-anticipated meeting. It always is. Am I looking forward to this game? YES! My best friend is a Habs fan and we usually don’t speak to each other for at least a couple of days after games. I have lost $100 to my brother betting on the Bruins against the Habs. It never ends and I can’t wait!